Simple Truth Chiropractic was chosen as America's Best Chiropractors for 2018, received the 2018 Grand Rapids Chiropractor Award, and has been rated a Top Care Provider by Grand Rapids Kids for 2019. We also have over 225+ five star reviews on Google. Click here for our April 2019 New Patient Specials! 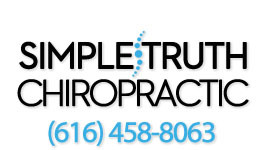 Welcome to Simple Truth Chiropractic! Thank you for visiting Simple Truth Chiropractic. You're here for a reason. Whether you saw our reviews and thought that we could help you or one of your friends told us we could help you with your problem, we are excited you're here. We see all kinds of problems in our office and have come to be known as the place that can help anybody. Browse around our site and get a feel for who we are. We have multiple doctors with multiple specialties in our office, including pregnancy chiropractic, pediatric chiropractic, sports chiropractic, auto accident rehabilitation and lifestyle education. We focus on structural corrective chiropractic care, which is very different from traditional chiropractic. This includes lifestyle education, specialized corrective chiropractic care on your spine and your extremities, and very detailed measurements to determine progress every step of the way. Also, take time to read some of our testimonials to get a feeling of what kinds of cases that we see and can help with. If you have a problem that you've been dealing with for a while, we'll let you know if we can help you. If we can't, we'll let you know that too. Don't let these problems continue any longer. Our doctors and staff will work with you to help get you out of pain and increase your quality of life as quickly and efficiently as possible. Our office prides itself on getting to the root of the problem through structural corrective chiropractic. If you've already scheduled an appointment, we will e-mail you paperwork that you can fill out, but you can also take some time to download our new patient paperwork as well. This will save you an extra 15-20 minutes in our office. Sign-up using the form or call us at (616) 458-8063 to take advantage of this exclusive web offer.